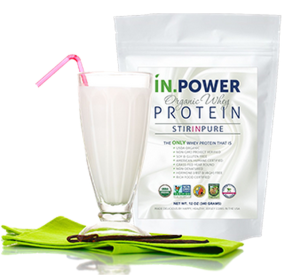 IN.POWER Organic Whey Protein: Stir in Pure! 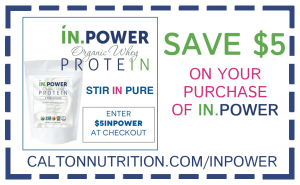 Our new IN.POWER organic whey protein powder is the only whey protein on the market we would put our name on! Protein is an essential component of your blood, bones, muscles, nerves, organs, and even your immune system. In fact, it is needed by just about every major system of the body. Throughout the course of the day, your body tissues break down and must be repaired and/or replaced – in order to accomplish this task, your body needs a steady supply of high quality protein, without it, your health may suffer. Our IN.POWER organic whey protein powder consists of just one single, delicious ingredient – 100% pure USDA organic whey. We searched for the world's purest, best tasting, most biologically active protein, and we take it everyday to supply our bodies with the essential building blocks we need to thrive! All whey protein is NOT created equal! There are so many different proteins out on the market, pea, rice and hemp proteins are popular with vegans and some vegetarians, but they do not provide a complete amino acid profile like whey protein. Just like everything else in life, quality matters when it comes to choosing the best whey. Look for a high- quality, pasture raised, organic, cold processed, non-denatured whey protein concentrate free of GMOs ingredients like soy, corn and wheat as well as chemicals, artificial colors, sweeteners and of course sugar. You can read more about why IN.POWER is superior, and top quality HERE. Ready to order IN.POWER? We're giving our Calton Nutrition family exclusive savings! Use this coupon at checkout to save!